The Vietnamese Football Federation on Sunday announced a ban on six female players who fought after a recent match in Ho Chi Minh City. 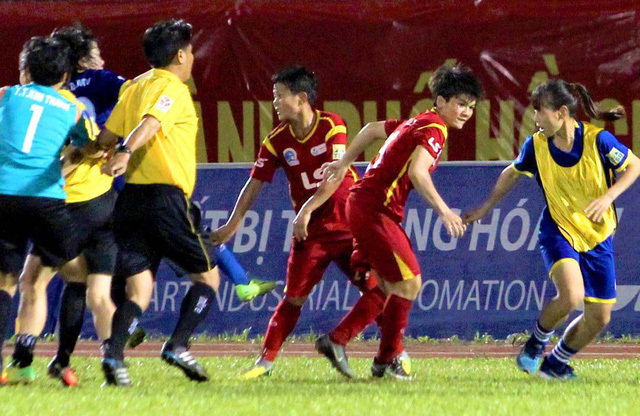 Six female football players from Ho Chi Minh City 1 Football Club and Than Khoang San Football Club fought after a semi-final of the Vietnamese women's football championship concluded in chaos in Ho Chi Minh City on October 12. The players, four from Ho Chi Minh City 1 Football Club and two from Than Khoang San Football Club fought after a semi-final of the Vietnamese women's football championship concluded in chaos in Ho Chi Minh City on October 12. With home advantage and a stronger squad, the HCM City club dominated the game throughout, scoring two goals in the 16th and 51st minutes and booked their place in the final. In the last minute of the second half, Nguyen Thi Van of Than Khoang San FC, a club based in the northern province of Quang Ninh dangerously tackled Truong Thi Phung from HCM City, but the referee decided to let the teams continue playing. Phung then got up and chased Van in anger, even as the referee blew the final whistle. Other players joined the fray as Phung and Van fought each other. Some fans also joined the violence. One player of Than Khoang San FC was beaten and thrown to the floor. The players were stopped after a few minutes by the referee and other officials. According to the Vietnamese Football Federation, four players from HCM City club including Tran Nguyen Bao Chau, Nguyen Thi My Anh, Tran Thi Phuong Thao and Tran Thi Thu will be banned for five months and have to pay fines of VND 10 million (USD440) each. Pham Hoang Quynh and Khong Thi Hang from the Than Khoang San FC were also given the same penalty. The two teams were fined VND30 million (USD1,312) each for the incident. After the match, coach Doan Thi Kim Chi from the Ho Chi Minh City 1 Football Club apologised to fans. "I am so sorry for the incident," she said. "These ugly acts should not have happened in football. Myself and other officials tried to stop my players from the fight but failed." HCM City 1 Football Club and Than Khoang San Football Club are rivals. The two teams previously brawled at the Vietnam National Games 2010. The southern team has won the national championship seven times, including the past three years, while the HCM City-based club were champions in 2007 and 2012.